Puerto Vallarta, Mexico - By far, Puerto Vallarta's most popular tourist attraction is the new Malecón. Located in the city's center, the Malecón is the jewel of the town; a considerably more than one mile long seawall, or boardwalk, that stretches from Los Muertos beach in Viejo (old) Vallarta at the south end to Hidalgo Park at the north end. The reconstructed, revamped, repaved, expanded, and enlarged waterfront walk-way is at the heart of the Vallarta's renascence. Gone are the narrow sidewalks of old with few places to sit, broken cobblestones, and all of traffic noise and fumes. The new Malecón is a wide, brick-lined, pedestrian-friendly, traffic-free boulevard with plenty of benches for people to sit on and lots of trees for shade. A place for romance and excitement. A place where you will find enough things to do and see to keep you fascinated today and also provide you with memories that will last you a lifetime. Some of the things you can see on the new Malecón on a typical sunny afternoon include stilt walkers, dancers in costume, clowns, mimes, artists, musicians, fishermen, sand sculptors, skaters, and people riding the bicycles built-for-two that they provide there as a courtesy for locals and tourists alike. 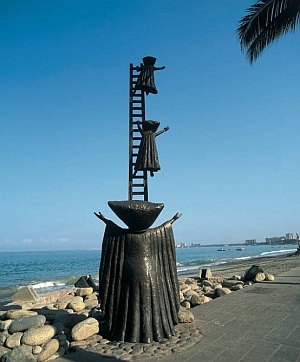 Strolling along the promenade, one passes numerous Puerto Vallarta landmarks, attractions and statues including one of this beach town's most beloved pieces, the Friendship Fountain, with its three dolphins. Small stores selling everything, from hand-stitched sandals and Cuban cigars to fresh-squeezed orange juice and fresh fish, line one side of the Primavera tree-lined Malecón, while the waves from the Pacific ocean crash on the other side. Sidewalk cafes, restaurants, and tortilla and taco stands are jammed in among places to book excursions, pharmacies, Oxxos (Mexican convenience stores), and money-changing booths, called Cambios. Near the center of this waterfront boulevard is the large outdoor amphitheater, Los Arcos (the Arches,) where live entertainment and all different kinds of outdoor attractions occur nightly. Xiutla folkloric dancers, live music, cultural events, and the ever-popular clown shows are just some of the things that can be seen here every evening. And speaking of the evenings, the night clubs along this waterfront boulevard can be compared to the most extravagant party spots anywhere; with complex sound and lighting systems, lavish decor, and the most affable wait staff this side of the border. There is something for everyone on the new Malecón and, yes, the Puerto Vallarta downtown Malecón area which, along with other tourist locations in this beach city, are safe to walk around and enjoy, day and night.